The truth is that there is no one way to use social media - social media needs to tie into the whole organization and connect to business outcomes. 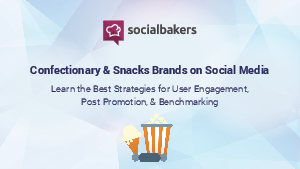 It's important to look at specific industry verticals like Confectionary & Snacks, and see how the best social marketers in that space use social metrics to drive their brand forward. This report explores how the best confectioners have found content trends that enable them to reach more Fans and prospects than ever, on a more efficient budget. For Confectionary & Snacks brand marketers aiming to maximize the value they get from their social marketing, this is an essential read.